Updating a 1940 Bungalow in Altadena "AFTER"
After buying a 1940 bungalow, the new owners and I met to discuss how we could update it by opening up the rooms, especially the kitchen/laundry and the dining room and living room. They also wanted to update the bathroom. This client’s goal was to marry a variety of styles including classic, transitional, and mid-century modern. I developed a new floor plan that removed several walls: most of the wall between the kitchen and the living room; the full wall between the kitchen and dining room, and the full wall between the laundry and kitchen. To maximize function, the new center island was placed between the living room and kitchen, featuring seating for three. The island and base cabinets are in a rich black Shaker style cabinet with a walnut cutting board top. The island has a dedicated wastebasket cabinet for garbage and recycling as well as many drawers for pots & pans.On the opposite wall, the owner’s existing 1940’s O’Keeffe and Merritt range was designed to anchor the new long exterior wall. White shelves and white subway tile surround the new stainless steel hood. The walls are painted a light grey. A new farm sink under the existing corner windows, and an adjacent 2 drawer dishwasher with matching cabinet face, completes the cabinet run on this wall. With the wall removed between the kitchen and the laundry rooms, the kitchen is extended with a tall pantry, new refrigerator and a corner with white Shaker base and wall cabinets. The new stacking laundry pair is next to a broom closet. The solid wood exterior door was replaced with a French door to flood the space with daylight. All the new dark bronze ceiling lights are a classic style with LED Edison bulbs in keeping with the period feel of the house. We replaced the worn oak floors with new red oak flooring throughout the house. The bathroom was also transformed. The blue-green subway wall tile is framed in black, and the floor has black 2” hexagon tiles. The new tub and shower has a splash panel enclosure. The vanity was replaced with new cabinet, sink and faucet. The new counter top is 1” white hexagon tile with a frame of black tile reminiscent of the 1940’s. A new wall light and medicine cabinet between the existing windows, completes the design. By opening up the rooms, we created a more functional space for today’s life style. The selected finish materials provide the charm you would expect in this 1940 bungalow. The updated kitchen style with a functional layout and fantastic finishes really comes together. 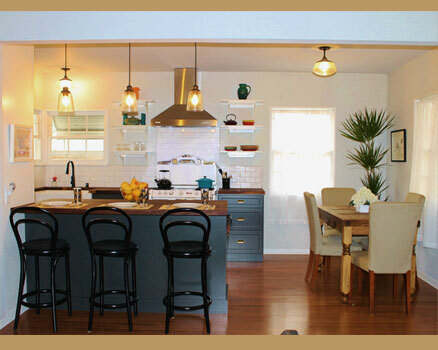 The clients were more than pleased with the outcome in their remodeled home.